So I just recently had the pleasure of seeing this Friedkin great, and for the first time in a while was left in absolute wonderment. I actually said "wow" out loud. The scene I'm referring to is about 2/3 through the film when the 4 protagonists are well into their journey through the Jungle. The massive rain and wind storm hits which leads them down an unsafe path. They are forced, one by one to cross a very old, low hanging bridge, over a rushing river. The trucks look like they are going to get blown over into the water the entire crossing. I'm left absolutely amazed by this scene, so I have to ask if anyone out there knows the magic behind it? The scene in question is the scene William Friedkin has referred to as the most difficult in his career. The bridge was designed by John Box using carefully hidden hydraulic components allowing control of the movements of the bridge and the trucks alike. Its first iteration was constructed in the Dominican Republic over a period of three months, and it required $1 million to complete. BCdotWEB helped here. Forget you saw this. Fnord. Soon after completion, abnormally low rainfall caused the river to dry up, forcing the crew to relocate, much to dismay of the studio. They found a new location in Mexico. The previously constructed bridge had to be disassembled and re-anchored. Friedkin's crew's arrival caused a major disturbance in the vicinity among the locals because of his reputation as a director of The Exorcist. However, a part of the population offered help to finish the structure. Ultimately, this river also became stricken with drought, which forced the application of some practical effects to complete the scene. In order to create artificial rain, Friedkin employed sewage pumps draining water from the river and diverting it to a sprinkler system. This scene alone, which lasts 12 minutes, took several months to complete and cost approximately three million dollars. 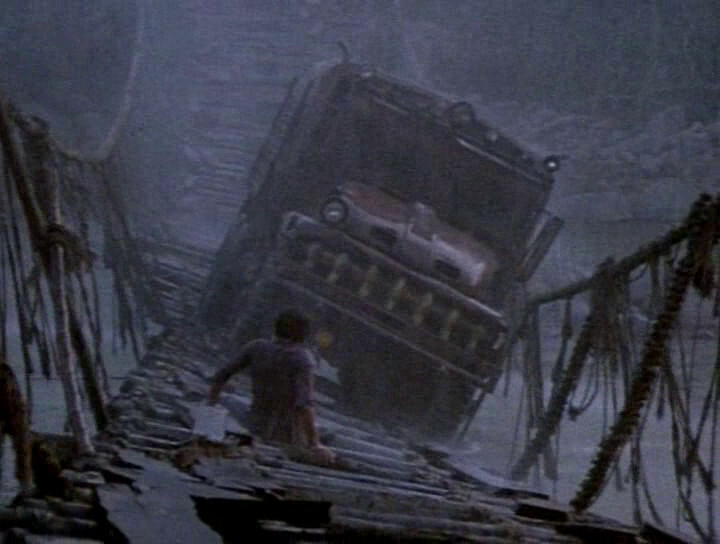 The bridge itself was so rickety that, despite the safety precautions, the truck (often with an actor inside of it) slid off the side and into the shallow water five times during rehearsals and filming. ESQ: I heard that the trucks fell into the river. WF: We dumped those trucks many times with guys in them and had to fish them out, which took hours. ESQ: It reminds me of when Francis Ford Coppola was making Apocalypse Now. You guys were making films that were dangerous to the cast and crews. Those films would never get made today. WF: Nor should they. I believe today that there is no film and no shot in a film that is worth a squirrel getting a sprained ankle. We were irresponsible in that regard. Apocalypse Now is a great movie, and when you watch it you don't think about how dangerous it was to make, but it was. Not the answer you're looking for? Browse other questions tagged film-techniques sorcerer . How do they film minors smoking? How did they shoot/record the One Day More scene? How do they film new born babies? How did they film the nuke explosion in Broken Arrow? How did they film the fight scenes in 'Legend'? How do they film animal death scenes?